Beginning with the British colonists, eastern white pine (or white pine) has proven to be one of the most important and most desirable species of North America. It is a truly magnificent tree attaining a height of 80 feet or more at maturity with a diameter of two to three feet. White pine is considered to be the largest pine in the United States. 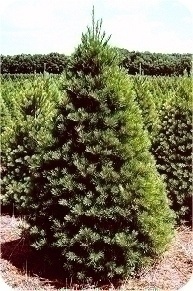 In colonial times, white pines above 24 inches in diameter were reserved for England to be used as ships masts. These trees were identified by blazing a broad arrow on the trunk. Because of the colonists general dislike of British rule, this "broad arrow" policy was one more source of friction between the two. Until about 1890, white pine was considered the species of choice for most commercial uses. It is the state tree of Maine and Michigan. 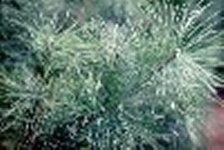 Leaves (needles) are soft, flexible and bluish-green to silver green in color and are regularly arranged in bundles of five. Needles are 2 1/2-5 inches long and are usually shed at the end of the second growing season. Both male and female flowers (strobili) occur on the same tree, with pollination occurring in spring. Cones are 4-8 inches in length, usually slightly curved and mature at the end of the second season. Cone scales are rather thin and never have prickles. Cones also have exudations of a fragrant gummy resin. Click here for the best tree stand in the world; made right here in Nebraska. It will be the last stand you ever buy.